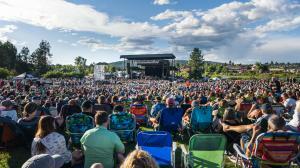 BEND, OR, USA, February 21, 2019 /EINPresswire.com/ -- Les Schwab Amphitheater was chosen to receive the All At Once Sustainability Award for Jack Johnson's 2017-18 All the Light Above It Too World Tour. The award acknowledged only three venues in the United States that excel in waste reduction and sustainability. The Bend, Oregon venue received the award due to the implementation of several waste reduction measures and initiatives to boost energy conservation as part of its ongoing practices. "Several years ago, we started a program called the ‘Take Note Initiative’ that was designed as a formal program for reducing waste and making the amphitheater a more environmentally friendly venue," said Marney Smith, director for Les Schwab Amphitheater. "Each season, we expand the program to accomplish our sustainability goals. We are honored to be recognized for this work, as we believe incorporating sustainability wherever possible is vital to creating a better community." In a written statement, Jack Johnson said, "I’m grateful to these venues, festivals and promoters for showing real leadership in the movement to green the music industry. You are thinking outside the box to make concerts more sustainable, which also offers a better experience to the fans. We are exploring ways to promote reusables and wipe out disposable plastics and I loved looking out at the crowds each night and seeing so many people using reusable cups. I am proud of the All At Once Sustainability award winners for your commitment to reduce single-use plastic and for leading by example."